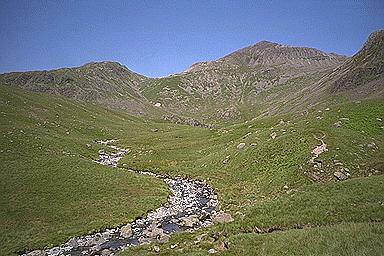 Esk Pike and Bowfell, with Ore Gap between them, lie ahead. The lower slopes of Crinkle Crags are on the extreme right. The path continues on the right of the beck up to Ore Gap but those following this walk will turn off, to the right, for Three Tarns. Larger version of this picture.